The Chargers are now 7-0 after a 42-6 win over the Crosby Bulldogs. 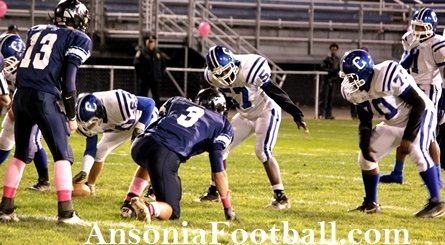 Ansonia was led by sophomore RB Arkeel Newsome who contributed with 118 yards rushing and three touchdowns. Senior QB Elliot Chudwick threw for 130 yards including a touchdown pass to junior WR Andrew Matos. Tyler Lester also tossed a touchdown pass to Jake LaRovera. Sean Rowley had a 3-yard touchdown run for the Chargers. The Chargers are now 7-0 overall, 4-0 in the NVL Brass division.